Why certainly! I love to play Croquet! So glad you asked! Croquet was very popular and would have been the “latest and greatest” social outdoor game in the mid-1800s. Why? At the time it was considered the first outdoor game that was approved for men and women to play together. It was not too athletic for ladies and not too effeminate for gentlemen. Peterson’s Magazine (June 1864) extolled, “This capital out-door game for ladies and gentlemen is just now exceedingly popular.”[i] A description of the game and a set of rules followed this declaration. In fact, entire families could play—young and old together. Not only was Croquet a very social recreation, it was considered very healthful since it was played outside. 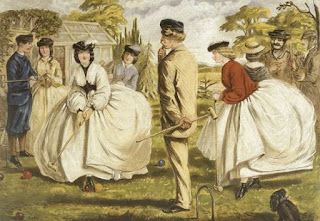 In the preface to the rulebook, Croquet, by Captain Thomas Mayne Reid, he stated, “Unlike the games already mentioned, it is a sport of the open air, and therefore highly conducive to health; while it has the advantage of most other out-door amusements in affording an easy exercise to the body, without requiring the violent muscular exertion which renders many of these objectionable to persons of delicate frame.”[ii] By the way, this particular rulebook by Captain Reid, copyrighted 1863 and published in Boston and London, is thought to be the earliest American-published rulebook. The exact origins of Croquet are murky. However, descriptions of a similar game actually appear as early as the 1600s, waxing and waning in popularity over the years. Sets of rules were somewhat varied, depending on the era and region, but were not generally codified until the mid-1800s as the game once again emerged into popularity. In the mid-Victorian era Croquet returned to the forefront primarily in England and was then exported to America from there. Initially the game was played mainly by the upper crust of society simply because one had to have a large flat, cleared space for playing. However, it was not long before all societal levels created their own opportunities to play. Eventually the popularity of the game caused it to be the subject of works of art, books, music, and fashion. Incidentally, a nifty invention was patented that helped ensure the popularity of Croquet when it resurged. This machine was the lawnmower, patented in 1830 by engineer Edwin Beard Budding. How handy not to have to have to use sickles and scythes to tame the lawn! Instead of waiting around for more reenacting events to occur in our region, a few years ago I decided that it was time to invent fun excuses for our local network of reenacting friends to get together more often. We needed an activity that would appeal to men and women, and something that a variety of age groups could play. Hence, our annual Croquet Picnic was born! Our back yard was sufficient for setting up the playing course, so the venue was taken care of. I had found an 1860s rulebook for Croquet. Next we needed to locate equipment. In reading the rulebook, it gave equipment specifications and it was clear that we needed to find a set or two of mallets that more closely resembled those of the 1860s. The earlier mallets generally have longer handles than most modern sets. I was happy to find some older sets and a decent looking modern set, all of which are wooden with no modern plastic. We now had a rulebook, a venue, and enough equipment sets to allow plenty of people to play. The next item to make the day complete was to choose appropriate refreshments. None of our network of reenacting friends (which I informally dubbed The Southern Victorian Society) lives in the same town so everyone would be traveling a minimum of about an hour to attend. I finally concluded that having a noon picnic would be the best option since I was hoping the occasion would be a day-long event and I wanted everyone well-fed. And if we were all going to dress 1860s and play this vintage game, it only made sense to have a vintage-style picnic. Everyone was encouraged to research what foods would be typical Southern fare (since we are all in South Carolina) and to choose appropriate dishes to bring. The idea was enthusiastically embraced and when the day arrived, the picnic tables were laden with delicious foods. Books such as The Carolina Housewife, by Sarah Rutledge; The Robert E. Lee Family Cooking and Housekeeping Book, by Anne Carter Zimmer; and An Antebellum Plantation Household, by Anne Sinkler Whaley LeClercq, were consulted. Our Southern menu included fare such as venison, fried chicken, ham, Hoppin’ John (I even used a heritage Carolina rice for this recipe), pickled okra, skillet cornbread, farm fresh butter, applebutter, seasoned carrots, succotash, pound cake, gingerbread, peach pie, cold cider, iced tea, and more! No one departed hungry! We set up two long tables for the main meal and another table for desserts. I needed large pieces of fabric to disguise the modern tables and I found several plaid queen-sized sheets that looked good enough until I could find something better. I did find lovely linen napkins, however. We used antique transferware plates, I found goblets that look suitable for the period, and I already had silverware that looked fairly appropriate. We also used antique pitchers for drinks. I encouraged everyone to bring their food in dishes that would complement the 1860s theme as much as possible. Because of our South Carolina weather, we held our picnic in the cooler fall so the table centerpieces were made up of autumn leaves, gourds, pumpkins and the like. Directly after the scrumptious noon meal, those who wanted to play Croquet chose up sides. The game was the afternoon entertainment as the appreciative audience on the sidelines cheered, jeered, and gossiped. My husband, Ray, was the resident technical expert on how to set up the course and how to play the game. He used Beadle’s Dime Handbook of Croquet (reprinted by Sullivan Press) for reference since it was the most easily accessible 1860s handbook at the time. Squabbles over rules were an ongoing issue in the past history of the game, but as nearly as we could tell the disagreements were over minute details and the gist of the game actually did not vary greatly. Therefore, we felt comfortable using the Beadle’s 1866 edition as an accurate representation of the game. Having since found Captain Reid’s rulebook online, we will consult it next time as well. Succinctly stated, according to Beadle’s, the object of the game is, “…to drive the balls through all the hoops, in the direction indicated by the dotted lines on the diagrams, [The diagram is furnished in the rulebook] and to strike the two posts. The side all of whose members succeed in performing this feat first wins the game.”[iii] This sounds like a friendly, tidy little game until you realize that in order to win, each side may make adversarial moves against their competitors along the way. Several crafty team members on both teams immediately began exploiting any and all opportunities for thwarting the opposition. For instance, Beadle’s explains, “If a player hit with his own ball any of the others, he is allowed to place his own against the ball he has struck, and setting his foot upon his own ball, he hits it with the mallet, and the force of the blow drives the opponent’s ball a considerable distance in the direction toward which the mallet is directed.”[iv] Not only that, “…he is at liberty to drive the ball in any direction he pleases.”[v] This is a polite way of saying that your opponents are allowed, and likely, to smack your ball clear out into the bushes if they get the chance! It is then up to you to work your way out of your predicament when your turn comes….or it may even take you several turns to rescue yourself. One must certainly play very strategically and defensively in order to outsmart the opposing team members. Thus, our teams provided much merriment to themselves and the onlookers as each team member struggled to complete the course while performing dastardly tricks on the opposition as often as possible. You would be mistaken in thinking that when team members complete the course that they are now out of the way and no longer a threat to anyone. Adding to the controlled mayhem, there is yet another complicating factor to be reckoned with. Beadle’s continues, “When a player has passed through all the hoops he becomes what is called in the technical language of croquet a rover, and is privileged to rove about all over the ground, croquing [sic] his friends and foes.”[vi] In other words, the rover could still smack opponents’ balls off course and help his teammates win. As you can see, there can be plenty of challenges for the teams! The nature of the game also allows ample time for good-natured teasing and light-hearted conversation. In our case, since our group of reenacting friends only see each other now and then, combining this type of social recreation along with the picnic works perfectly for an enjoyable day of visiting. 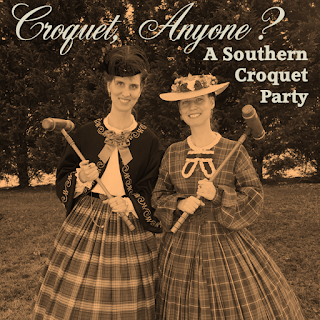 We are all looking forward to our next Southern Victorian Society Croquet Picnic. 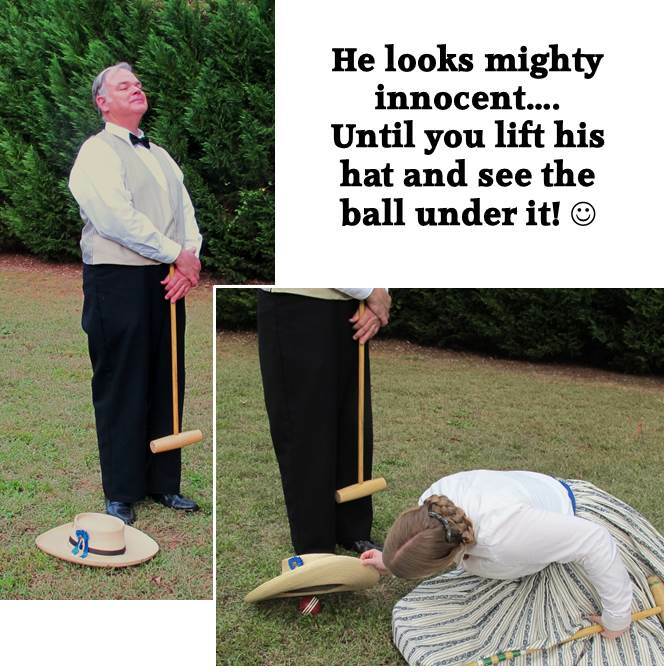 I highly recommend a croquet party to you and your friends! Charlton, James, William Thompson, Roger Adler, Katherine Alder, and Andrew Adler. 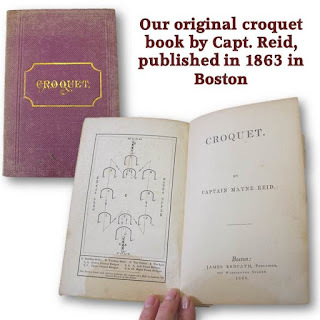 Croquet: Its History, Strategy, Rules and Records. Rev. ed. Lexington, MA: Stephen Greene Press, 1988. LeClercq, Anne Sinkler Whaley. An Antebellum Plantation Household: Including the South Carolina Low Country Receipts and Remedies of Emily Wharton Sinkler; With Eighty-Two Newly Discovered Receipts. Columbia, SC: University of South Carolina Press, 2006. Reid, Captain [Thomas] Mayne. Croquet. Boston: James Redpath, 1863. Routledge, Edmund. Beadle’s Dime Handbook of Croquet. 1866. Reprint, West Chester, PA: Sullivan Press, 1999. Rutledge, Sarah. The Carolina Housewife. 1847. Reprint, Columbia, SC: University of South Carolina Press, 1979. Scheuerle, William H. Croquet and Its Influence on Victorian Society: The First Game that Men and Women Could Play Together Socially. Lewiston, NY: Edwin Mellen Press, 2013. Vernon, H.J. “Croquet and Troco.” Peterson’s Magazine, June 1864.
Zimmer, Anne Carter. The Robert E. Lee Family Cooking and Housekeeping Book. Chapel Hill: University of North Carolina Press, 1997. [i] H. J. Vernon, “Croquet and Troco,” Peterson’s Magazine, June 1864, 451. [ii] Captain [Thomas] Mayne Reid, Croquet (Boston: James Redpath, 1863), ii. [iii] Edmund Routledge, Beadle’s Dime Handbook of Croquet, (1866; repr., West Chester, PA: Sullivan Press, 1999), 12.